Bloggin' 'bout Books: Jenny Oaks Baker's Newest Makes a Believer Out of Me. Almost. Jenny Oaks Baker's Newest Makes a Believer Out of Me. Almost. I'll be honest, I don't listen to a lot of violin music. Too many years of attending screechy elementary school orchestra concerts may have ruined the instrument for me forever! Kidding, kidding—I love that my kids, along with all their classmates, get to learn to play violin. It's just that when I'm listening to music, I prefer rock or pop to classical. I need songs I can sing along to, you know? Which, come to think of it, might be why I decided to accept this CD of violin music for review. 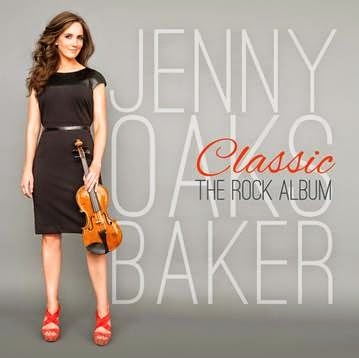 I'd heard of Jenny Oaks Baker, an LDS, Juilliard-educated, Grammy Award-nominated violinst, but until now, I had never listened to any of her music. Something about her newest CD, though, made me want to change that. As you can probably surmise from its title—Classic: The Rock Album—it includes violin versions of popular (singable!) rock ballads. From well-known oldies like Yesterday (The Beatles) and Scarborough Fair (Simon & Garfunkel) to more recent hits like Sting's Fields of Gold and Everybody Hurts by R.E.M., the CD offers a nice variety of recognizable songs on its ten tracks. Although I appreciate beautiful violin music, I admit I've often found it snooze-inducing—that's not true at all with Baker's newest collection. Even the more melancholy numbers feel not just upbeat, but also uplifting. While I enjoyed all of the pieces, my favorite is Liverpool Suite, a medley of Beatles songs. It's lively and fun—the perfect choice for Track #1. So, did Baker's latest convince me to head right over to Spotify and download as much violin music as I can find? Well, no. However, it did remind me how lovely the instrument sounds in the hands of a master. And, okay, that it wouldn't hurt me to listen to more inspiring music (especially when played by Baker), even if it doesn't have any words. A serious epiphany, I'm telling you! Classic: The Rock Album, which comes out on April 7, can be pre-ordered from Amazon, Barnes & Noble, Deseret Book, and other retailers for under $20. To the FTC, with love: I received a free copy of Classic: The Rock Album in exchange for an honest review from the generous folks at Deseret Book. Thank you!